This is a story about a recent meeting of Observant Lodge, Anchor Bell. One of California's newest "Micro-Lodges." The brethren assembled at 6:30 PM this past Friday. Attire was black tie, which most all guests conformed to. The lodge was set with candles (electric,) and chairs were assembled around the altar in a circle. At 6:30 PM sharp, those that wished to participate in a group meditation sat in the circle. We were asked to relax and assume a state of mindfulness as we were guided by our Chaplain, a graduate of the Guthrie Academy of Reflection. The Academy of Reflection is a course specifically built for mindfulness and meditation in a Masonic context. The door was tiled so that anyone arriving late would not be able to disturb the meditation. Within fifteen minutes we were stripped away of all of the stresses of the day and even the week. We were ready for lodge. At 6:45 the brethren were asked to clothe themselves and assume seats in the lodge room, still lit by candles and dim lights. The officers assembled in two parallel lines without the door, in tuxedos and white gloves. The Marshall rang a bell and asked that all remain contemplative and silent until lodge was opened. All electronics were set to off. The Master and Chaplain processed in. The chaplain had a censer lit with incense which was set at the altar. The wardens processed in next ringing Tibetan singing bowls, which were joined by a third from our Organist in the North East Corner. Two by two the rest of the officers made their way to the altar and then their stations. The incense was extinguished and the lodge was opened. The room was relatively full, with more guests than members due to a some officers being out of town. Once lodge was opened, a motion was quickly moved and seconded to postpone the reading of the minutes and all unnecessary business to the following stated meeting in July. Being a small lodge with few assets, we had no bills to pay for the month, nor applications to be read. The Master directed the Senior Deacon to arrange the altar for refreshment so the brethren could be free from restraint until the sound of the gavel in the East. The Worshipful Master of a nearby, large, and very established lodge gave a 30 minute presentation on the sacred geometry of the parallel lines, point within a circle, and the Saints John. While this topic is often discussed at length as to its surface qualities and relationship to Masonry, the presentation skipped the introductory Masonic meanings we all are (or should be aware of,) and dug deeply into the underlying meaning of this symbol and its use in other cultures, systems and historical artworks. The discussion weaved into the speculative and esoteric elements of everything from Rosicrucianism to Egyptian Legends, Alchemy to Kabbalah. In some ways the ideas were a bit challenging and even unorthodox, but that sort of discourse is something encouraged in this lodge. 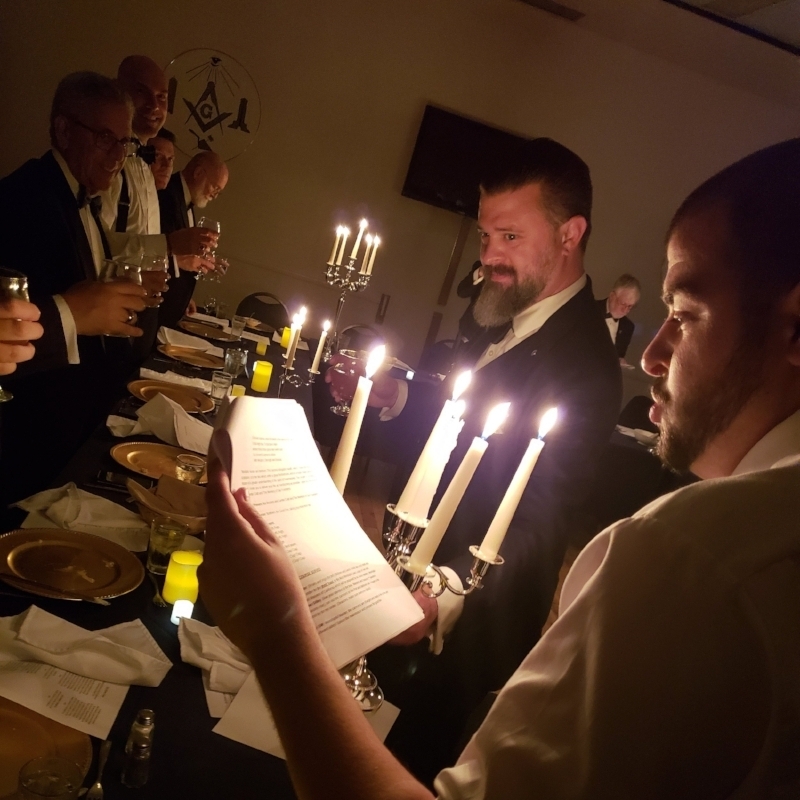 Lodge was closed in full form and the brethren made their way to the dining hall for an extended version of the usual formal Agape. The event was extended from a four course banquet to seven, and three formal toasts to seven or more. 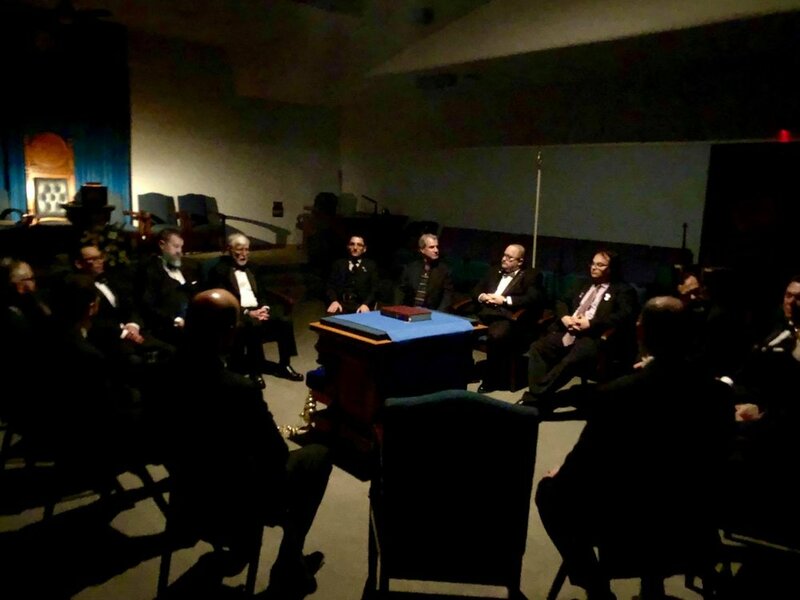 "This is what I expected when I joined Masonry"
The brethren entered a room lit by candelabras, tables set with chargers, linen napkins, and custom branded goblets with the lodge’s insignia, square, compass and all seeing eye. Appetizers were already set on the plates and pitchers of barrel aged Admiral Nelson’s Blood Rum Punch were at each table. The evening unfolded by opening the festive board with a very unique ritual containing allusions to old Noachite and Maritime traditions, inspired by the lodge’s name and symbol; the Anchor and Bell. The Master gave the first the traditional toasts, and the brothers slipped into the warmth of fellowship, aided by the strong punch. Traditional and spontaneous toasting followed throughout the night as seven plated courses of soup, salad, pasta, entrees and desserts were served by the catering staff to the brethren. Between spirited discussions, many laughs and brotherly love, the evening was peppered with several original and traditional songs, Masonic poetry reading… and more punch. Coffee and cookies were served, and many of the brethren retired outside to enjoy a cigar or pipe and continue the conversation deep into the evening. In attendance were many guests from other lodges, as well as two men with an interest in Masonry. Many of the guests were Past Masters of their own lodges, and they inquired about the process of starting a new lodge. The best phrase given of the evening was from a friend and Worshipful Master. This author's heart swelled with pride at the comment, and while there is a long journey ahead for Anchor Bell to sail, for that moment, we felt we had accomplished everything we hoped to with a new lodge. Disharmony in Lodge; it’s not a bug, it’s a feature. The Copiale Manuscript Part I.
Cleopatra's Needle, a link to the ancient builders?